As I saw the Galaxy Tab S4 booting up for the first time, I had a huge smile plastered on my face. It’s always great to see such a big and beautiful Super AMOLED display even though this is the fourth Galaxy Tab S tablet. 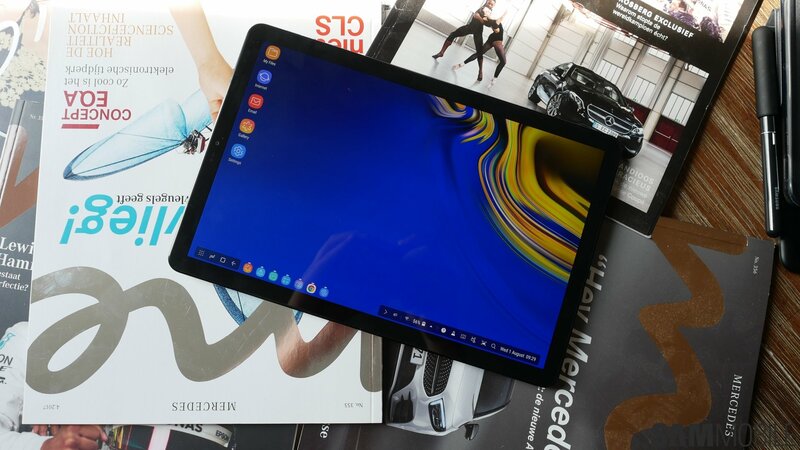 In fact, when we received the Galaxy Tab S4, we were happy to see a new high-end tablet from Samsung without its traditional home button, putting the display front and center, so that’s why I started our Galaxy Tab S4 hands-on by talking about that 10.5-inch screen. And the display is beautiful, as I already mentioned. Samsung has also switched back to a 16:10 ratio for the screen so we can enjoy watching videos without black bars at the top and bottom. But the on-screen navigation keys can present a challenge in landscape mode. Why? 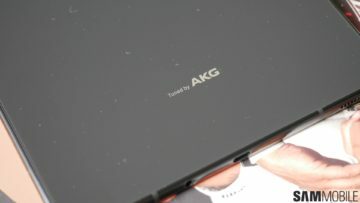 Well, like the physical home button and the capacitive navigation keys on previous Samsung tablets, the software keys are placed at the center of the screen, away from the left and right corners. 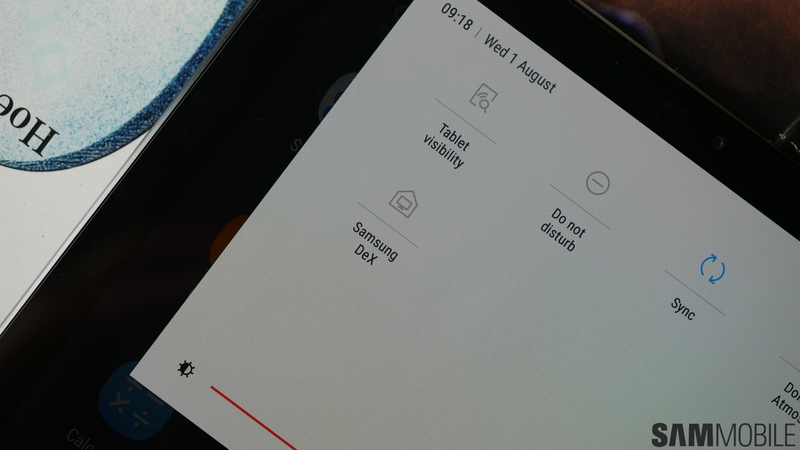 People don’t usually use the tablet in landscape mode the same way they would use a phone, but I wonder if Samsung could have implemented the option to access the navigation keys by swiping in from each corner of the display. However, the good thing is that in landscape mode, the notification shade now shows up only in the area where you swipe down to access it. So if you swipe down from the left side of the display, the notification shade will show up on that side, making for easier one-handed use. The Galaxy Tab S4’s four speakers are once again tuned by AKG, but this time we have Dolby Atmos support as well. I have to say the speakers are crazy loud, and enabling Dolby Atmos makes for noticeably richer sound. 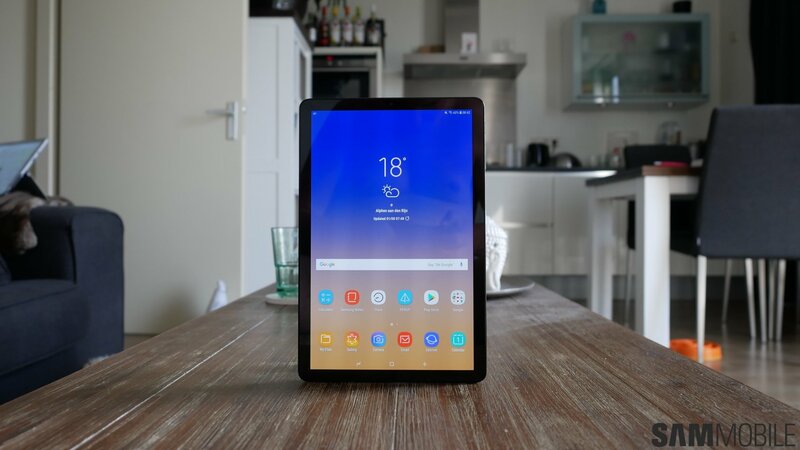 However, thanks to the short time we’ve had the Tab S4 in our possession, we will only be able to comment on how the speakers complement the stunning AMOLED display in our final review. The same goes for the new DeX mode that Samsung has introduced on the Tab S4. 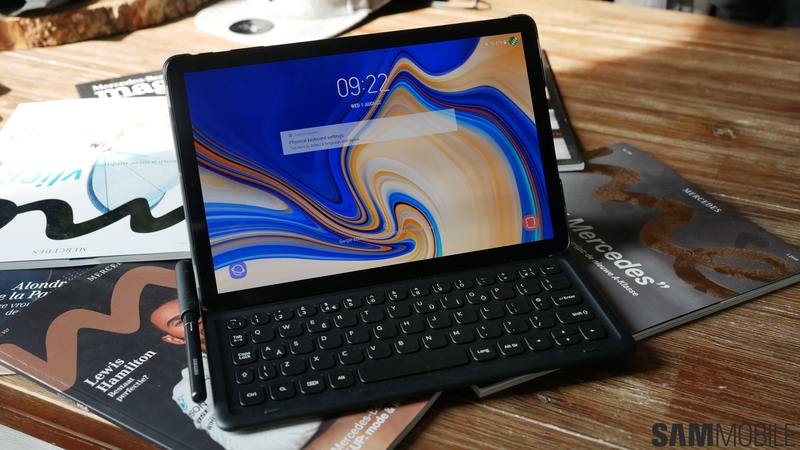 You don’t need a DeX dock to access a desktop-like interface on the Galaxy Tab S4. 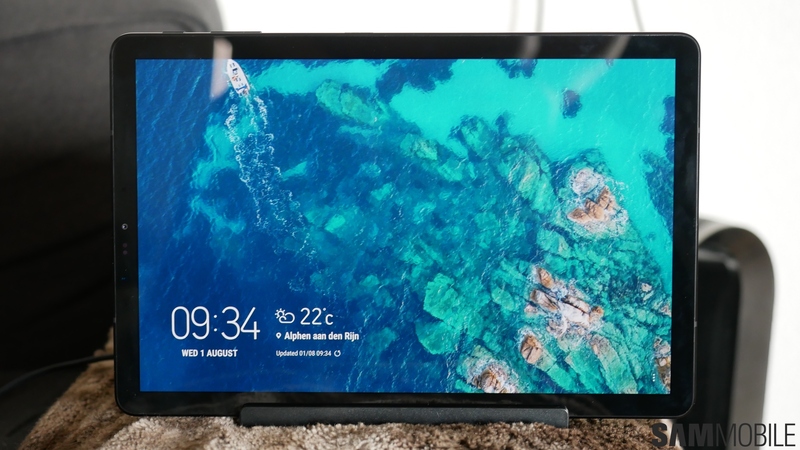 It happens right on the tablet screen, and you can also turn the Tab S4 into the second monitor by connecting it to an external monitor using a USB Type-C to HDMI adapter. The tablet display can then be used as a trackpad or as a drawing surface. Samsung has also added a feature called the Daily Board, which you can use with the charging stand accessory. Daily Board displays images from the gallery and information such as the weather, time, and calendar appointments while the tablet is charging. 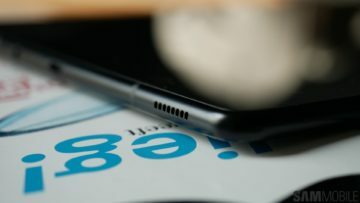 Samsung says Bixby Voice 2.0 will also be coming to the Galaxy Tab S4 at some point, although it’s unclear how the voice feature will work without a dedicated Bixby button. Overall, the Galaxy Tab S4 feels like a fine-tuned version of the Galaxy Tab S3. 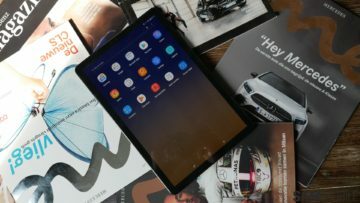 Our full review will arrive in the coming weeks and tell you all you need to know about Samsung’s latest high-end Android tablet. Finally tab s4 have barometric sensor or not ? In wikipedia write that exist ! 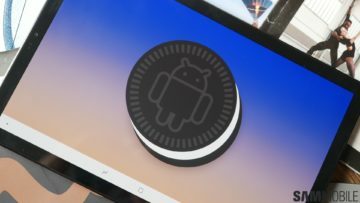 will the iris scanner work in landscape mode? AMOLED display and Dolby Atmos are a plus. However, these alone are not enough to make me give up my iPad Air 2. As for the rest of the specs, didn’t expect much so am not really disappointed. Expected Samsung to stick with mediocre hardware specs with a hefty price tag and they did just that. Samsung, Oh my Samsung, when wilst thou make a tablet worthy of thy name? So having a faster processor than the Ipad Air 2 (about 20% according to geekbench), more RAM, more storage, better camera, better screen, better sound quality, integral stylus support, larger battery, DEX integrated, not to mention Android rather than iOS isn’t enough of an upgrade for you?!? what does it mean Bixby will be available via MR and released in a software update in 2019?